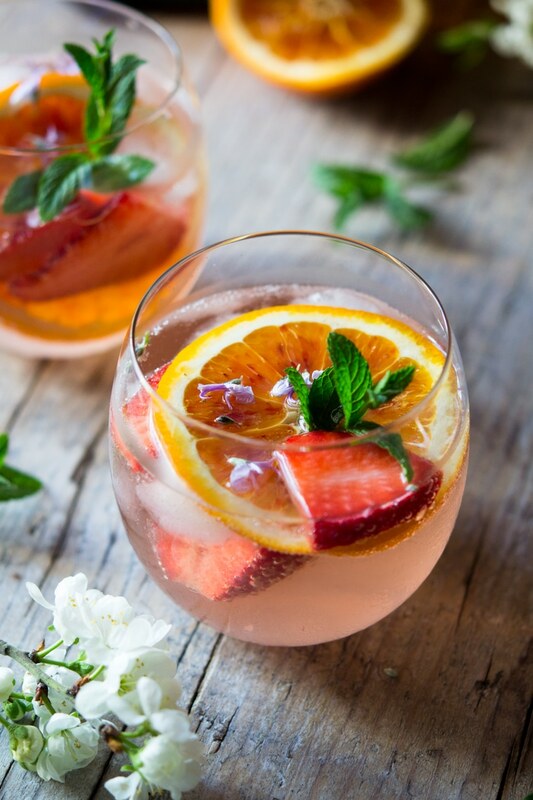 A delicious sparkling rose cocktail made with Cointreau, mint, orange slices and chopped strawberries. So refreshing, easy to make and bursting with spring/summer flavours. Cheers! Who else is so excited it’s Saturday? No work, the weather is beautiful and time to chill! Personally, I love to make my weekends a little extra special than any other day of the week and that sometimes (quite often) involves a cheeky little cocktail or two. Step in, Cointreau Rose Cocktail with chopped strawberries (obv). This cocktail is sooo easy and is made with only 3-4 ingredients depending on your preference and need for pretty things…ME. Who else hates when cocktails sound amazing but you then have to go and buy 4-5 different and always expensive liqueurs? So annoying! I want a cocktail that doesn’t involve 100 different things yet still tastes so delicious like my Sparkling Limoncello Cocktail. 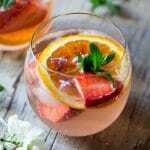 Well, let me tell you that this pretty rose cocktail is just that, it has a delicious orange, sparkling rose flavour and you have boozy strawberries to eat at the end! Gotta have your 5 a day, right!? 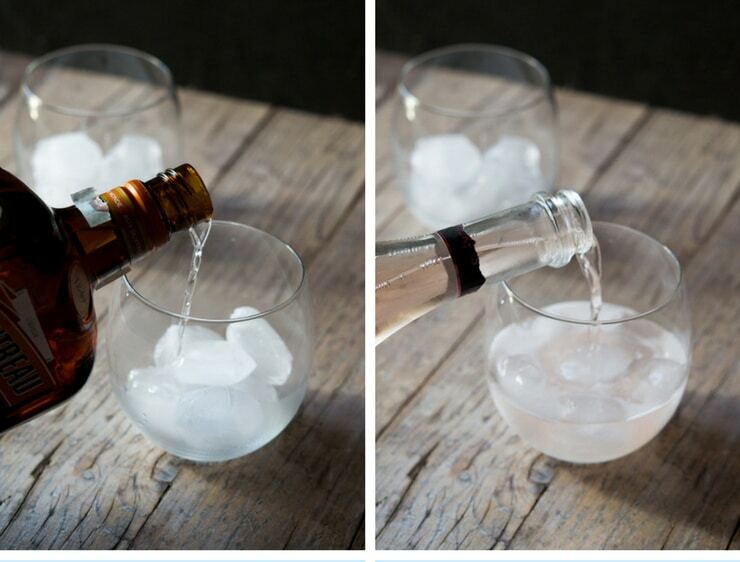 Fill up a tumbler or wine glass halfway with ice. Pour in half a shot of Cointreau liqueur (add a full shot if you want it a little stronger but try it first). Top up with sparkling rose wine to an acceptable level….I’ll let you be the judge and stir. Finally add a large slice of orange, chopped strawberries and a sprig of mint. Tip: I also added some edible flowers to make it extra pretty. Top Tip: If you don’t have sparkling rose wine you can use normal rose wine and top with soda water. 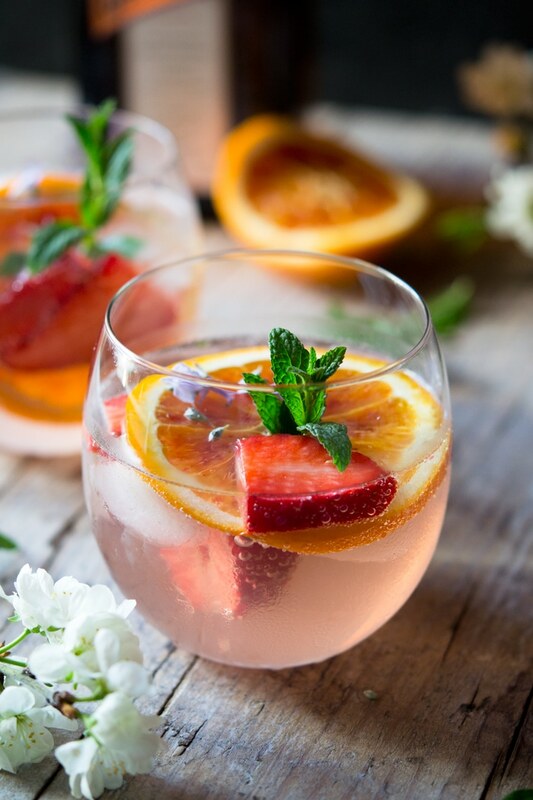 If you’ve tried this Cointreau Rose Cocktail or any other recipe on the blog then don’t forget to rate the recipe and let me know how you got on in the comments below, I love hearing from you! You can also FOLLOW ME on FACEBOOK, TWITTER, INSTAGRAM and PINTEREST to see more delicious food and what I’m getting up to. Top up with sparkling rose wine to an acceptable level....I'll let you be the judge and stir. Top Tip: If you don't have sparkling rose wine you can use normal rose wine and top with soda water. This looks delicious! We have so much mint growing in the garden and have been trying to find ways to use it up. We will have to get the ingredients to try this out soon. mmm this cocktail looks incredible! Perfect for a summer. I definitely want to try it and I’m sure it is very tasty! Thank you for sharing this great recipe! This looks so summery and refreshing and I love that it doesn’t need multiple steps like some cocktails – such simple ingredients and quick and easy to make! Definitely going to be sipping this in the sunshine. Thanks so much Bintu, enjoy! These look beautiful and so refreshing too. Perfect for a summer garden party. This sounds epic. I have a bottle of cointreau in the cupboard and never know what tl do with it!